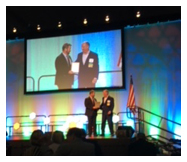 It was our honor to join members of PPMA at the State Leadership Forum at PestWorld in Baltimore last week. With the state legislature in session that day, we were drawn back to Harrisburg that same day to continue to protect and advocate for your interests. It was an amazing experience to work visit with the staff of NPMA and to engage with other state leaders and Executive Directors. We plan to continue to grow this network to better serve you, the membership. Congratulations to Marty Overline who was awarded the Committee Chair of the year award for his work with the PestVets Committee. Congrats, Marty! If you haven't registered for the upcoming Annual Meeting, DO SO NOW! We will be meeting at the Eden Resort in Lancaster, PA. An agenda and online registration information is available online at http://www.papest.org/education-and-training/ppma-annual-conference/. Vendor registration information is also available at that link. Be sure to mention you are with the Pennsylvania Pest Management Association when making your hotel reservations for the special room rate. NESDCA is excited to announce that we will be sponsoring certifications for our membership in Lancaster Pennsylvania on November 13th, 2017. Please note that to participate in this NESDCA certification you must be a current member of NESDCA. If you are not a current NESDCA member then you only need to complete the application for certification at WWW.NESDCA.COM to begin processing your membership. Contact Peter Arnold at 570-351-4942 upon arrival for location information. DUE TO LIMITED SPACE, ONLY TEAMS THAT HAVE REGISTERED AT WWW.NESDCA.COM WILL BE ABLE TO PARTICIPATE IN THIS CERTIFICATION. Have any of you ever dealt with bed bugs in a multi-story building? We deal with it all the time and find these structures to be very challenging. Many of them are occupied by hundreds of people, many of whom are very social. They come and go using common elevators, frequent the community rooms and visit tenants on various floors of the building. A bed bug infestation in a building of this magnitude can be stressful to deal with and can spiral out of control very fast. Treatments can also prove to be an obstacle because you are dealing with multiple people and different lifestyles. In a multi-story building you will find people who sleep on the floor, some on the couch and others in beds that look like they have been through war. Many times, sanitation is a problem. You can also encounter tenants that are handicap or have mental disabilities that prevent them from following the preparation procedures your company has in place. Sometimes taking a step back and looking over the situation you are faced with and trying a different approach will prove to be more efficient rather than demanding they follow your company policy. These people are often faced with challenges that no matter what you ask them to do- they won't or can't. Many companies use the same approach to treating bed bug infestations and while the saying often holds true "whether you have one or a hundred bed bugs treatment is the same" most times it is not. Once your customer is handed your preparation list they often clean house. Have you ever thought of this? They clean off their night stand in preparation for treatment so they take a DVD case and put it back on the rack possibly spreading these bugs to an area not prone to have clusters of bugs. Treatments in these types of structures must consist of adjoining units to the left, right, above and below. As you advance through adjacent units you will often find other infested units and must continue inspecting and treating in pattern. If your client is against this practice make sure to have them sign off on your recommendation so when you are sitting in front of a judge you can provide the documentation to CYA. Documentation should be a company priority. Today, thirsty bed bug attorneys are popping up everywhere including the commonwealth and are visiting your clients looking to find fault with your client or their pest control provider. Throughout the industry there are many options available to developing a proactive approach to bed bugs in multi-story multifamily environments. Make recommendations to your clients in writing that a proactive approach to bed bug control is available and should be followed. Scheduled monthly bed bug inspections, K-9 inspections, pitfall traps, volcanos, Activeguard mattress liners and encasements are some of the tools available to help you develop a proactive program. Make these recommendations to your clients in writing. 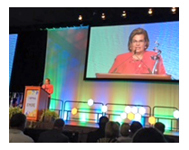 During yesterday's General Session, NPMA presented several prestigious awards, including the Pinnacle Award, the Women of Excellence Award, the Young Entrepreneur Award, the Committee of the Year Award, and the Chairperson of the Year Award. The General Session started with a short video from the Professional Pest Management Alliance (PPMA). 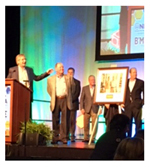 Bobby Jenkins, incoming PPMA chairman, honored current chairman Tommy Fortson of Terminix Service, for his years of service. NPMA President Elect Dennis Jenkins was the emcee for the awards. Jenkins outlined the recently introduced NPMA Health Insurance Exchange program, which partners with reputable insurance providers to offer members cost-effective benefit options. The 2017 Women of Excellence Award , sponsored by Target Specialty Products, was presented to Kim Kelley-Tunis of Rollins. Kim has used her technical expertise and skills as a trainer to further many careers. This award recognizes female pest management professionals who demonstrate outstanding leadership and have made notable contributions to the development and growth of other women in the industry. Sarah Thomas-Clark of Thomas Pest Solutions received the Young Entrepreneur Award , presented by Rentokil-Steritech. Sarah started her own company seven years ago, and is dedicated not only to the success of her business, but also to those around her. She has served in several association leadership roles, and is also very active in charitable organizations. This award recognizes young entrepreneurs (40 years of age or less) working in the professional pest management industry who have helped create or develop an industry business and/or those who have stewarded a meaningful industry concept to fruition. The Diversity Committee was awarded Committee of the Year . This committee was instrumental in the formation in the Executive Leadership Program, an in-depth curriculum that prepares professionals for association leadership. Marty Overline , Aardvark Pest Management, was the recipient of the Committee Chair of the Year . Marty chairs the PestVets committee, which searches for opportunities for veterans returning from service and looking for work. PestVets has created over 3,000 jobs for veterans, and Marty was essential in this endeavor. The Entomological Society of America awarded the ACE Professional Award to Alan Feuer . The award recognizes superior contributions of an ACE in the field of structural pest management. 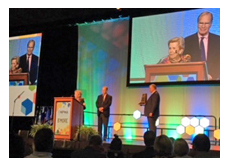 NPMA President Bryan Cooksey, III presented the Pinnacle Award to Judy and Bob Dold of Rose Pest Solutions. The Pinnacle Award, the highest honor NPMA presents, honors individuals who have contributed not only to the success of the association, but to the industry as a whole over a lifetime or career. 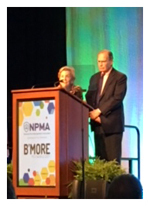 Both Judy and Bob have held high positions in NPMA - Bob was NPMA President in 1984 and Judy in 2001. Both are considered icons within the pest management industry. Please congratulate these very deserving recipients! This bill has passed the House with a vote of 125-63. It will move to the Senate for consideration. 10-10-2017 Can cockroaches help prevent asthma?